Conveniently located at the heart of the Southeast Region's industrial belt, the complex will greatly contribute to boosting the national economy by establishing a world-class industrial base for mechanical parts materials. Korea's status as a marine industry power will also be secured through the establishment of the marine industrial complex, offering multiple production, distribution, R&D and training functions, etc. Cluster core parts materials industries (one of the new national growth engines) including environmentally friendly ('green') automobiles, high value-added vessels, solar batteries, fuel cells, etc. Cluster cutting-edge convergence devices industries that involve advanced materials, IT parts and state-of-the-art equipment (linked with aviation transport). 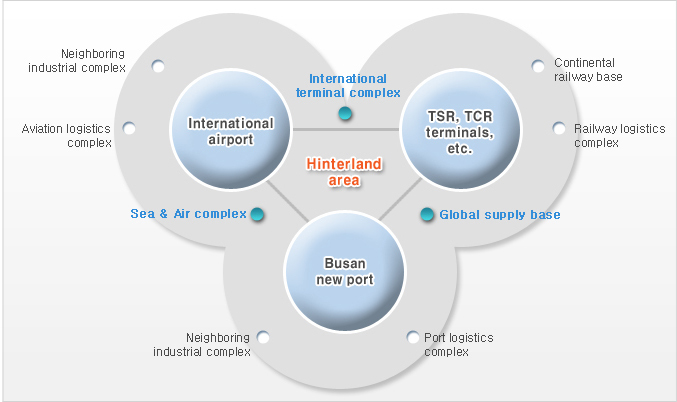 Take advantage of its location adjacent to Gimhae International Airport, and cluster production and maintenance facilities including aircraft parts, engines, etc. Develop the marine leisure equipment (motorboats, yachts, personal watercraft, etc. ), manufacturing industry, which is another future growth engine in Korea. ※ Work with marine leisure equipment centers, and small and medium shipbuilding technology institutes nearby. Study research and teach the latest marine technology. Attract multi-national corporations and research institutes involved with specialized industries to the southeast region as a Key base of global production and research networks. Reserve land areas for foreign investment companies, linked with free economic zones. Establish a global logistics complex linked with international land, sea and air transport facilities. A strategic point chosen by the Korean government to maximize the effects of FTAs. Build a Eurasian Gateway in preparation for North Pole and transcontinental railway routes. Establish a logistics complex comprised of top domestic logistics companies dealing with storage, assembly, processing, labeling, etc. Become a key logistics base for Outward Processing Trade by establishing a logistics complex with global manufacturing companies involving complex logistics functions. Serve as a global supply base for specialized industries in the Southeast Region such as shipbuilding equipment and implements, mechanical parts and the cruise & yacht industry. Serve as a global supply base for automobile parts by attracting automobile centers (K/D(Knock Down)) from other domestic areas and abroad. Reduce logistics costs of machine and electronics air freight in the Southeast Region by building an RFC (Ready for Carriage) center. Secure a pivotal position in logistics in Northeast Asia by establishing a SARR logistics complex linking sea/air/rail/river transport nodes. Build a SARR (Sea-Air-Rail-River) terminal complex. Build a sustainable future-oriented knowledge creation city. Build a core city that attracts people, information and capital to become a driving force for innovative new industries. Become a new landmark city as the new Venice of Asia by creating an environmentally friendly canal city. Knowledge services industry: finances and insurance, consulting, education, medical R&D, conventions, etc. Northeast Asian oil market and international shipping exchange. High-class marine tour leisure city: recreation, leisure, accommodation, waterfront. Location of a top-class residential complex nestled in a beautiful natural environment and offering a pleasant living environment for foreigners. To offer a fundamental solution for Busan city's chronic shortage of prime industrial plots. To transform Busan New Port into a high value-added port that 'generates a high amount of inbound/outbound cargo' by developing it alongside the neighboring industrial logistics cluster, and to ultimately make a huge contribution to national competitiveness. Laying a foundation to revitalize the economy of Busan and also the Southeast metropolitan area. Job creation: 876,000 jobs nationwide, 617,000 jobs in the southeast region. Positive effect on production inducement: 78 trillion won nationwide, 53 trillion in the Southeast region.